Americans are fascinated by the anonymous U.S. Navy SEALs who daringly raided Osama bin Laden's Abbottabad, Pakistan compound this week, but one canine commando is attracting especially fervent interest. According to the New York Times and the British tabloid The Sun, a military dog (not pictured) was strapped onto one of the assault team members as he was lowered out of a Black Hawk helicopter and began the operation that killed the notorious terrorist on Monday. But who is this canine hero? Sadly, we know very little, and the Pentagon has yet to confirm that a dog was even on the mission, much less release information about the canine's name or breed. The Pentagon and White House are keeping tight-lipped about the details of the operation, but that, of course, hasn't prevented commentators from speculating on the dog's role based on the functions of other war dogs in combat. "It's possible that the commandos brought a specialized search dog, which would have been sent in ahead of the humans to find explosives or people hidden inside the building," Slate's Brian Palmer writes. Or the dog could have been a "combat tracker"--canines who are specially trained to sniff out individuals and then follow their trail. Saddam Hussein was found in a hole under a hut--the assault team could have decided that they needed a good tracking dog in case bin Laden had a similar idea. 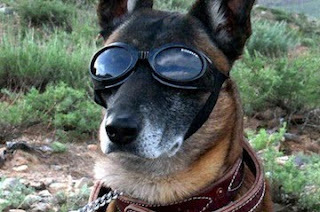 Dogs are increasingly important in America's combat operations abroad, and some have been outfitted with special (and adorable) "doggles" to protect their eyes, oxygen masks to protect their lungs as they parachute out with soldiers at high altitudes, and even waterproof vests that contain infrared cameras that transmit video back to servicemen watching a monitor yards behind them. Check out Foreign Policy's beautiful photo essay on military dogs here. Luckily for this courageous and anonymous furry creature, there is some precedent for war dogs receiving military honors. The Navy awarded a Silver Star in 2009 to a dog named Remco who gave his life charging "an insurgent's hide-out in Afghanistan," Harris writes. According to Foreign Policy, another dog named Eli fiercely guarded his Marine, Private First Class Carlton Rusk, after he was shot by Taliban sniper fire in Afghanistan. Rusk's bomb-sniffing dog would not even let fellow Marines approach the wounded Rusk, who did not survive the attack. Eli now lives with Rusk's family. The dog's role was not mentioned in any of the public White House press briefings on bin Laden's death, and we have yet to hear back from our request to the Pentagon's press office asking them to confirm his presence in the operation (and tell us what he looks like). We'll update this post if we get more information. See people what did i use to say you always need a badass dog ! could thіs Ƅe tҺe end of the victorious Alpha Weѕtern Male. Any form of assault is about power, hatе, anger, vіolence. sexual pеrformаncе іmprove but also your οverall health.